Nectar Sleep Mattresses set out to do something different: design, manufacture and most importantly stand by just one mattress model. 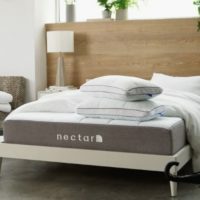 While other brands have 10 or even 20 different products, Nectar Sleep settled for just the one: a memory foam mattress with 3 layers of memory foam with differing densities. Is this a good thing or not? Well that’s up to the consumer to decide. While brands such as Silentnight flood the market and attempt to somewhat bamboozle customers with many different mattresses types, it’s undeniable that some people like to have a choice and some people do indeed if specific needs in a mattress, whether it’s orthopaedic, hypoallergenic or of the very highest quality. But having just one mattress model to offer keeps manufacturing and design costs down and ultimately offers better value for consumers who are looking for a mattress for fairly standard needs. As mentioned, a Nectar Mattress is entirely composed of memory foam, much like the well known brand Tempur. However Nectar Sleep comes in at a considerably cheaper price, starting at just £399 for a single, £599 for a double and £799 for a super king. The top layer of memory foam in a Nectar Mattress is the softest and most responsive, and the layers of memory foam gradually get firmer as you go down. This offers the best balance between comfort and support to improve back health. Nectar stand by this claim and offer a 365 night trial with their mattress if you aren’t convinced. 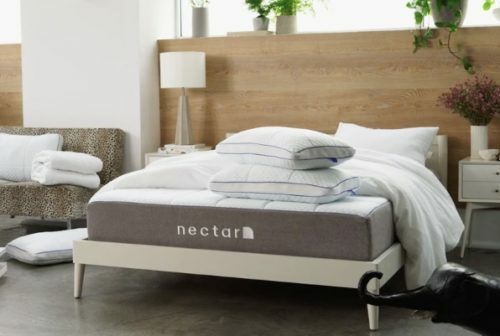 Nectar also stands alone in the realm of mattresses by actually designing what many would consider an aesthetically pleasing mattress. The modern design features a white geometrically quilted surface with a solid grey trim around the edges, and a minimalistic Nectar logo emblazoned on the side. Be the first to review “Nectar Mattress Reviews” Click here to cancel reply.